Henri Matisse (French, 1869–1954). 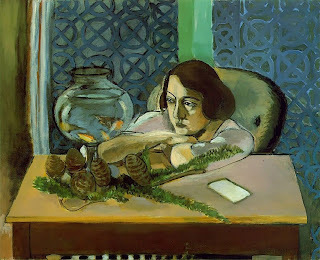 Woman Before an Aquarium, 1921–1923. I think I’m pretty good at painting a vignette with words. I can set a mood, sketch a character, but try and make that portrait come to life and my brain bogs down, its wheels sink into sand and spin, spin, spin in place. I’m stuck, and I’m stuck good. All that journalistic training to act as the impartial observer has me creating still lifes instead of stories. Right now I’m thinking about the passionate woman I created a few months ago, and her terrible streak of bad luck. What’s she going to do about this curse? I ask myself in the shower as I shampoo my hair. I ask as I pour my first steaming mug of coffee and sweeten it with cream. What’s she going to do? Do. Do. Do. Do. The word thuds in my head as I walk home from the kids’ school. It slaps against my skull as my sneakers hit the sidewalk, beats out a rhythm, a tribal calling to circle the fire and listen to a tale. But what is my story?